the arenas are used in the main menu danger room, the same igb maps are also used in the in-game danger room missions. ok i'll leave them there then. 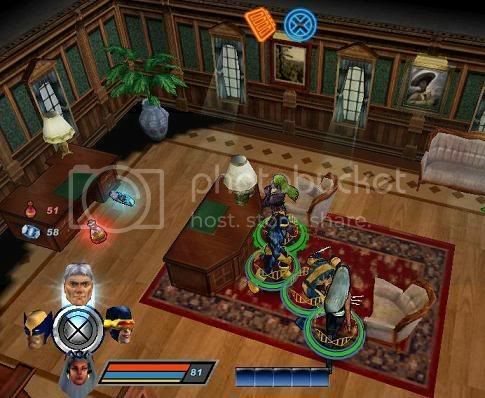 since mua doesnt have a danger room menu, are we just going to call the arenas from the in-game mansion danger room and leave them out of the sims? blizz, what did you have in mind for the sim missions if we are doing a xml1+2 conversion? since we can call the danger room missions from the mansion in xml1, will we leave the xml2 danger room levels as mua simulation missions? Leftover slots would be filled in with Flashback missions and versus missions, of course. i just tried your arena_dr in mua nodoubt_jr, it loaded fine, although BDOD as expected, i show a screenshot below. Note to anyone who did not know this before: you do not need to define a level in zoneinfo.engb to load it. I wasnt sure of it before, but now i am sure. oh cool, ok i'll download the ps2 assets file right now and i'll re-release the two arenas with ps2 igbs tommorow. Updated the first post. I'll finish mapping things out when I can. hub is first, healer is second. Oh, and mansion/dr_mag/ goes in act 1, as does xjet. ok heres the two arenas i had upped before, the Mansion and Danger Room, but with PS2 igbs now. Please test them out, when i finish all of them i'll up them in a big pack. either name is find with me, the only thing that would need to change is the names in the packages. i'll change it when i do the big pack so that its more xml/mua naming like, so i guess i'll use /arena for the arena megapack. i have two questions. first what do we do when we are done with a level? do we up it right away or wait for everyone else to be done? also how do we test a level, i know how to load the map, but not how to test the level? did you get xml1 enemies to work? yeah i had already converted Juggernaut for XML2, but i only know how to load the map, so no fight takes place. I also need to fix up the scripts cause one of them was causing my game to freeze. Move the start_game line in zoneinfo to the section for the new level to test. ok thanks i'll try it tommorow. i also wanted to mention that i'll be re-releasing some of the powerstyles for some of the XML1 character conversions. i had changed the power names for some characters (i think only 2 of them) to power_attack and power_xtreme, etc, so that people could use all the powers in the danger room. But i dont know how changing power name will effect them in these converted levels, so i'll just change them back to there xml1 names. But dont worry major ones like Avalanche, Blob, and Mystique never got there names changed so they are good to go.